Our Abpromise guarantee covers the use of ab114283 in the following tested applications. This protein is best used within three months from the date of receipt. Integrin alpha-L/beta-2 is a receptor for ICAM1, ICAM2, ICAM3 and ICAM4. Integrins alpha-M/beta-2 and alpha-X/beta-2 are receptors for the iC3b fragment of the third complement component and for fibrinogen. Integrin alpha-X/beta-2 recognizes the sequence G-P-R in fibrinogen alpha-chain. Integrin alpha-M/beta-2 recognizes P1 and P2 peptides of fibrinogen gamma chain. Integrin alpha-M/beta-2 is also a receptor for factor X. Integrin alpha-D/beta-2 is a receptor for ICAM3 and VCAM1. Defects in ITGB2 are the cause of leukocyte adhesion deficiency type 1 (LAD1) [MIM:116920]. LAD1 patients have recurrent bacterial infections and their leukocytes are deficient in a wide range of adhesion-dependent functions. Both Ser-745 and Ser-756 become phosphorylated when T-cells are exposed to phorbol esters. Phosphorylation on Thr-758 (but not on Ser-756) allows interaction with 14-3-3 proteins. 12.5% SDS-PAGE analysis of CD18 protein (ab114283). Stained with Coomassie Blue. ab114283 has not yet been referenced specifically in any publications. Publishing research using ab114283? Please let us know so that we can cite the reference in this datasheet. 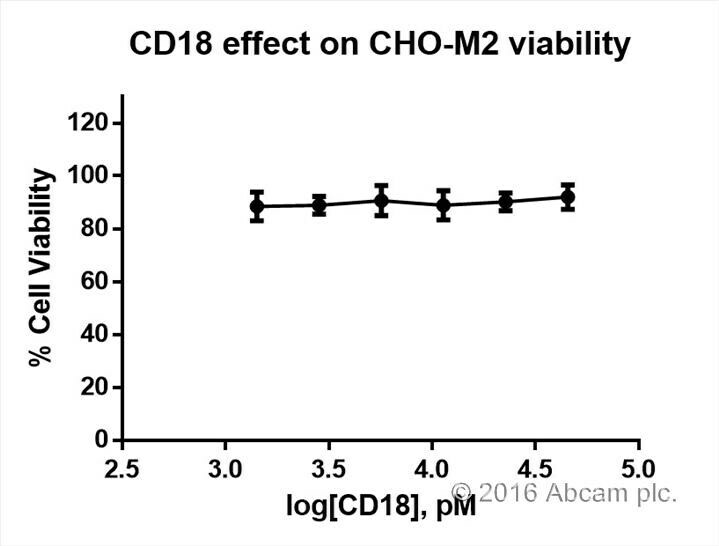 The effect of recombinant protein on cell viability is assessed using MTS viability determination method on cultured CHO-M2 cells incubated 42h in presence of different concentrations (45.5 – 22.7 – 11.4 – 5.7 – 2.8 – 1.4 nM) of rCD18. The viability is similar for the different concentration of rCD18. It doesn’t affect cell viability.